As GOP Lawmakers Eye Cutting Estate Tax, Will They Increase Income Inequality? As Republicans prepare to pass their massive tax overhaul, they are planning to lessen, or even eliminate, the estate tax. Critics say the tax plays an important role in making the economy fair. 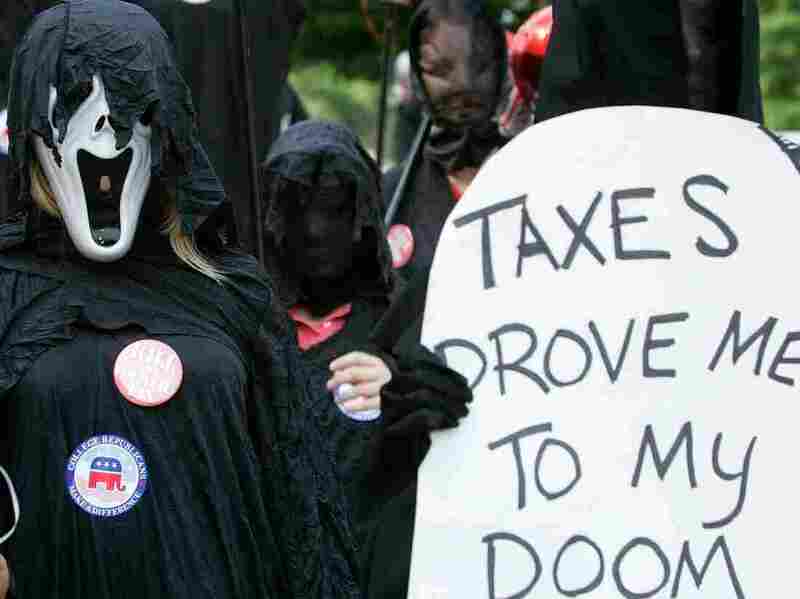 Members of the College Republican National Committee demonstrated against the estate tax in Washington in 2006. The tax was eliminated in 2010 but was reinstated a year later. Republicans in Congress are on the verge of fulfilling their longtime dream of eliminating the federal estate tax, and they could do it in a way that is even more generous to heirs than previous repeal efforts. Bills passed by the Senate and the House recently would reduce or scrap the taxes heirs now pay on estates larger than $5.5 million. And the bills would do so without repealing the so-called "stepped-up basis" provision. Ordinarily, people have to pay taxes when they sell off assets that have appreciated in value, like shares of stock or real estate. But heirs are exempted from that tax. That's because they already pay the estate tax. The bills approved by Congress recently would eliminate or reduce the estate tax, while leaving the exemption in place. In other words, you would be able to pass on assets that have gained a lot in value — like those Apple shares you bought years ago — and, unlike everyone else, your heirs never have to pay tax on the appreciation. To put it another way: Someone could inherit her grandfather's large beachfront mansion without paying estate tax, and sell it off right away without paying any capital gains tax. It's a much more generous policy than previous tax overhauls, says Lily Batchelder, a professor of law and public policy at New York University Law School. "We've never seen a proposal like this," she says. "I don't recall ever seeing a proposal that would both fully repeal the estate tax and fully exempt from tax all the accrued gains on these giant estates." The bill passed by the Senate early Saturday would double the exemption on large estates, allowing people to pass on estates worth $11 million to their heirs tax-free. The exemption for married couples would be $22 million. The House bill would gradually reduce the estate tax and then scrap it altogether in 2023. House and Senate leaders are now trying to reconcile the two versions of the tax overhaul, with a vote expected by the end of the month. The estate tax has long been the bane of conservatives. Congress briefly eliminated the tax in 2010, but it came back the following year and remains in place today. "We just think it's unfair. Death should not be a taxable event. And we should not be stopping people from being able to pass their life's work on to their kids," House Speaker Paul Ryan told Fox News recently. The estate tax brings in a relatively small amount of money to the federal Treasury, about $19 billion a year, even as it hurts the large economy, says Scott Hodge, president of the Tax Foundation. Because of the tax, people end up pouring money into tax shelters and paying hefty bills to tax lawyers, he says. The tax is especially onerous for assets that may be worth a lot on paper but are cash poor, such as certain kinds of businesses, Hodge says. In some cases, heirs have to break up or sell businesses to pay taxes, he says. People who want to keep the tax say such cases are extremely rare. They also say that at a time of growing income inequality, the estate tax plays an important role in making the economy fair. "The estate tax is basically a way of partially leveling the playing field, so that these heirs of massive estates don't have quite as gigantic a leg up in life," Batchelder says.